Thanks to an Environmental Grant several years ago, the Landscape department has been running a personal weather station down at the track off of Porter Field Road, with a second more recent station up at Breadloaf campus. 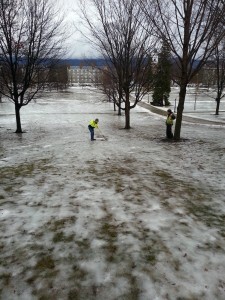 We depend on these stations for primarily for snow removal and IPM strategies. The data are also streamed to the Weather Underground, a weather web site that accumulates and posts data for over 10,000 stations across the US. Any compulsive weather addicts know how tricky it is to forecast weather for a region-most people say the forecasters are “wrong”. A better interpretation would probably be to say they aren’t accurate, and Vermont is a great example of why. The National Weather Service has various offices, and ours is in Burlington at the airport. 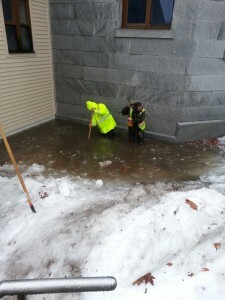 They cover a large area, from Lake Placid to Montpelier, and from the Canadian Border to Killington. The only way to accurately forecast an area this large is to break it into regions. 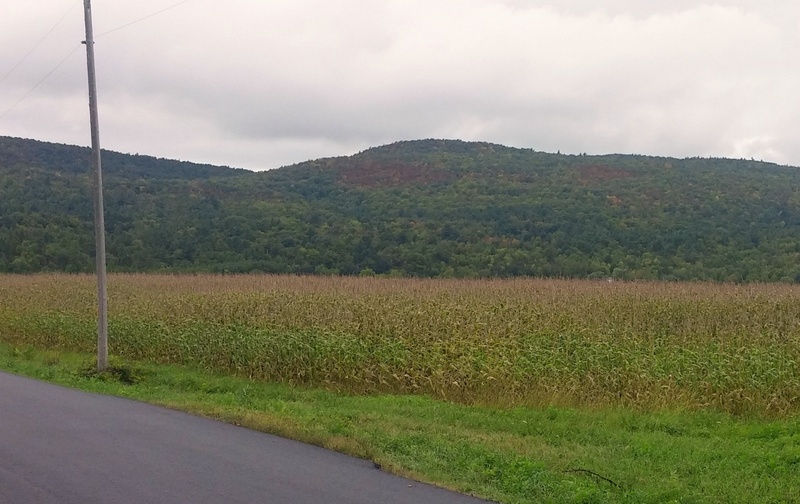 For example, our region is number 9, Western Addison, including the cities of Vergennes and Middlebury. 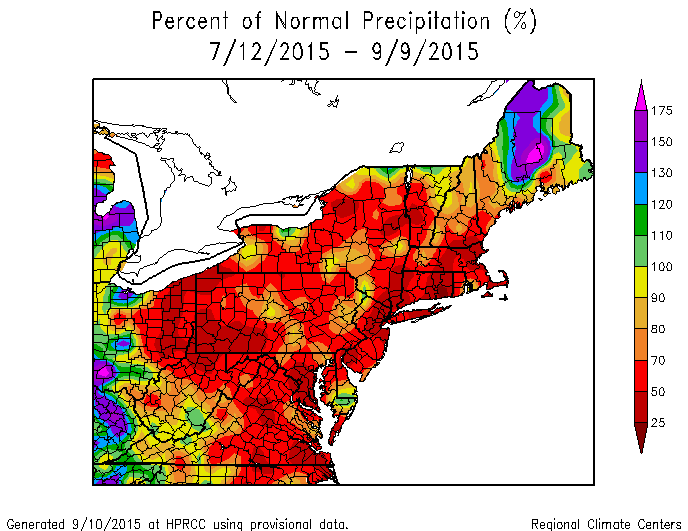 And here lies the problem with forecasting, particularly in the winter. 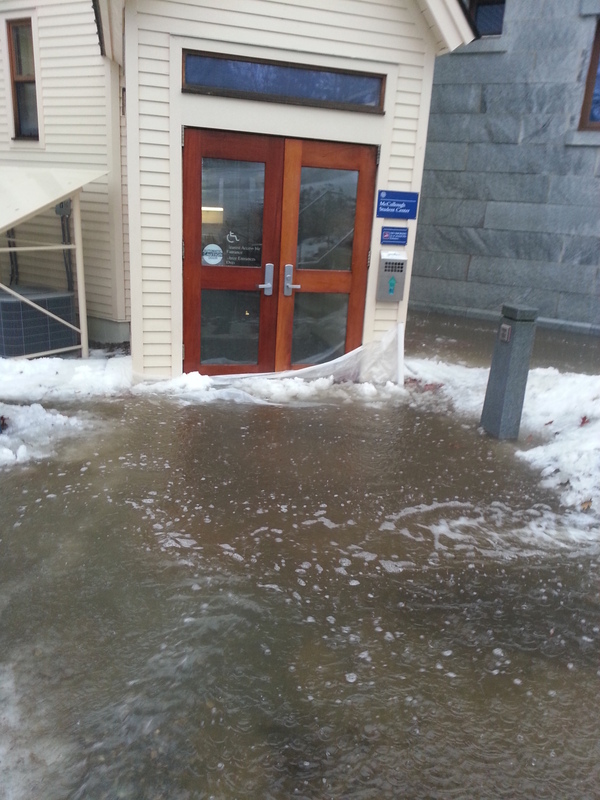 Middlebury campus is under the same forecast as Lake Champlain, and Vergennes shares the forecast with Brandon. It’s a huge geographical area, and one forecast for such a space is bound to lose accuracy across the region. 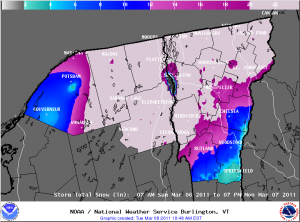 Addison may get an 1″ of snow, low in the valley, while East Middlebury may be getting hammered with 6 times that, under the same forecast. The Weather Underground has been taking the National Weather Service forecast, and re-packaging it on their website, along with access to some great radar maps, blogs, photos, etc. Recently, however, they’ve starting forecasting themselves, called Best Forecast, and what makes this different is the data, not only from all of the NWS weather stations, but all of the personal weather stations such as ours. Slate just wrote a great article explaining this. 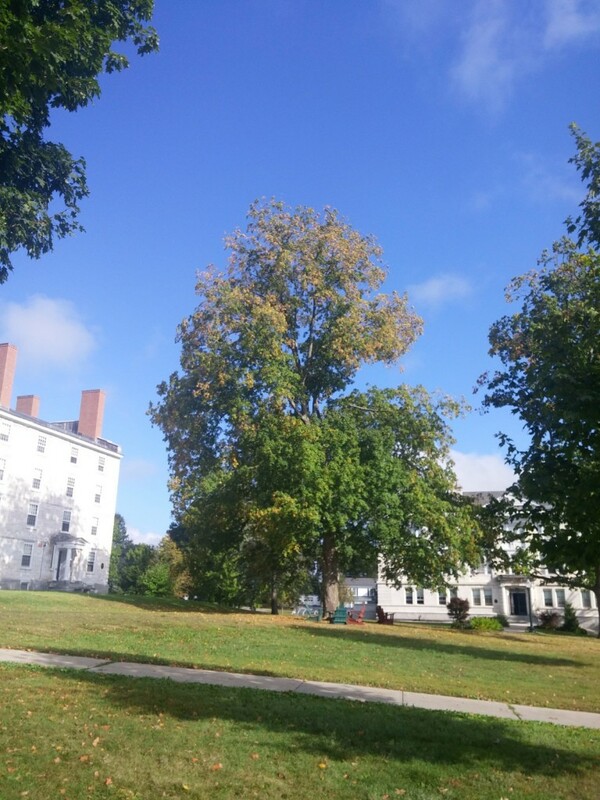 Suffice it to say that Best Forecast is now taking into account microclimates, so when pulling up a Middlebury forecast on the WU, we are getting a Middlebury campus forecast. How accurate? We’ll find out tonight and tomorrow. The NWS is forecasting a dusting to 2″ of snow tonight, with an additional 3-5″ possible tomorrow before it changes to rain. Temperatures mid 20′s tonight, mid 30′s tomorrow. Best Forecast? Lows of 28 tonight, 50% chance of snow or rain, high of 45 tomorrow, snow than rain in the afternoon, snow accumulations of 1″ possible. I’m not placing bets on who is correct here, but the Best Forecast feels right to me. I’ll post an update when all is said and done. UPDATE 4PM: The NWS issues forecasts at fairly regular times, 3 PM or so being fairly regular. Their update for the western addison zone has changed slightly, 2-4″ during the day tomorrow, changing to rain in the afternoon, back to snow Friday night with an additional 1-3″. Mid 30′s tomorrow, mid 20′s tomorrow night. Best Forecast has changed little-snow and rain tomorrow, accumulation 1″, chance of ice pellets, snow and rain friday night, only 60% chance, no accumulation mentioned. UPDATE 12 NOON FRIDAY: The NWS has changed their forecast, as the storm seems to have slowed down from the west. No snow last night, and only light snow now at noon, not accumulating. So do we call this a win for Best Forecast? Both forecasts now are in line with each other for snowfall tonight, 4-6″, but Best Forecast is calling for temps today around 45, with the NWS saying mid 30′s, which it is now. I’d be surprised if temps rise today. This entry was posted in Midd Blogosphere and tagged snow, snow removal, storm report, Weather, weather station on February 23, 2012 by Tim Parsons. Like a guest that just won’t leave, the effects of Irene the Hurricane still seem to be around Middlebury. 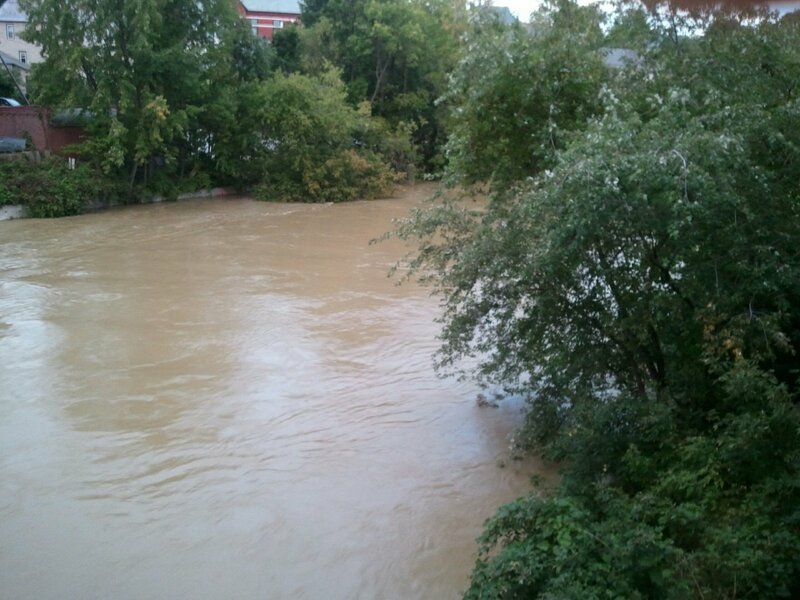 Primarily what we’re watching now is the Otter Creek. It takes a while. All the headwaters that feed into the creek have been slowly dropping, like my own muddy Lemon Fair River, and so the Otter Creek is rising. How fast? The football team, at Middlebury for pre-season practice, skipped the weight lifting today and went to fill and stack sandbags at Jackson’s on the River (the old Tully and Marie’s to you alumni) ( The old Woodie’s to you older alumni). (Great little article here). Another stream feeding the deluge is the North Branch River, the one that falls along Route 125, heading up to Breadloaf and the Snow Bowl. Last I heard, the road is still closed (picture here), although Breadloaf is still accessible by back roads. 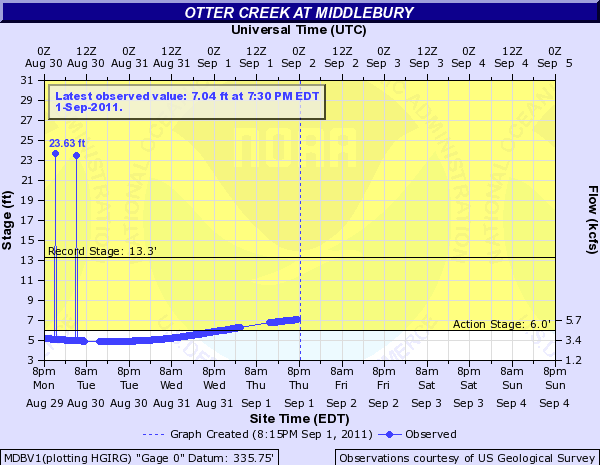 As I write, the Otter Creek in Middlebury is at 6.9′, within the top 20 crests of all time, and is thought to reach peak tonight around midnight. 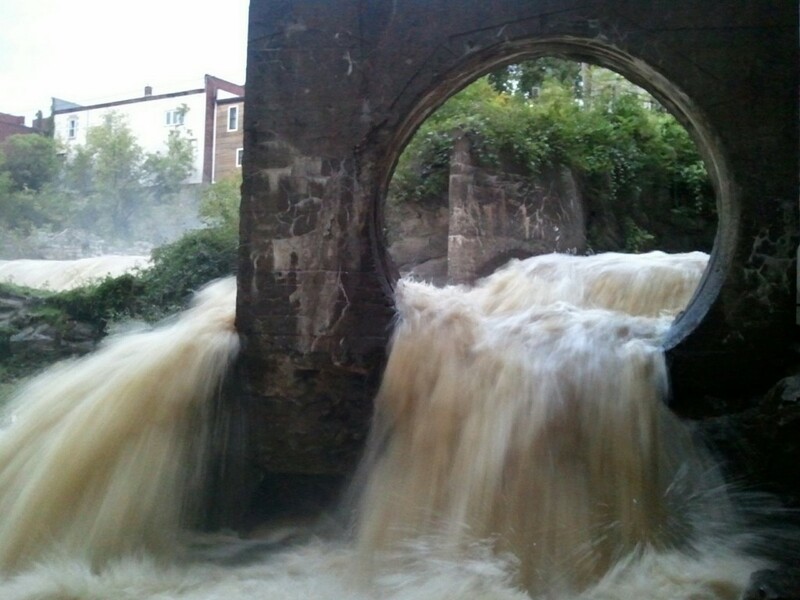 Not wanting to wait that long, I took some pictures downtown to try and capture the feel of a simply amazing amount of water, brown and muddy, crashing through town. One of our seasonal landscapers was a dairy farmer in Orwell for 30+ years, and in his experience he’s never seen water so muddy. Another guy in our shop is at home, an island experience, surrounded by water on all sides unable to come to work. 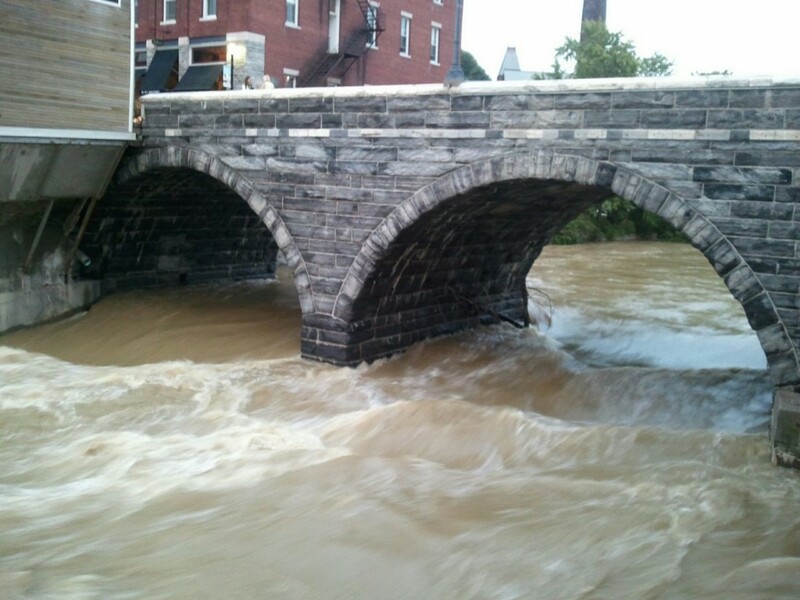 This entry was posted in Midd Blogosphere and tagged flooding, storm report, Weather on September 1, 2011 by Tim Parsons. Given all the flooding and destruction in the state, I feel very fortunate here at Middlebury, and at my house overlooking the Lemon Fair (flooded, but looks like a normal spring). 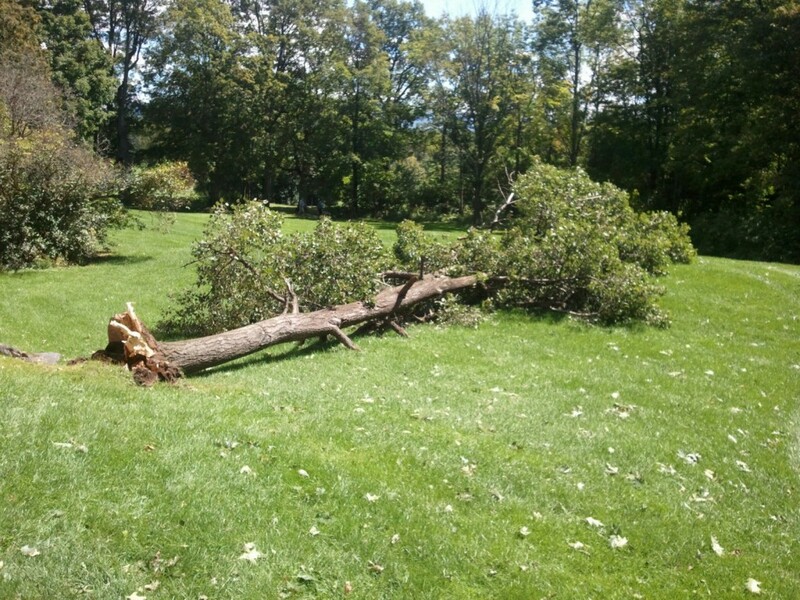 While we certainly had some damage on campus, it feels relativly minor compared to friends in East Middlebury in need of a new backyard. Irene brought 3.21″ of rain to the main campus weather station, to bring a wet August total to about 7 3/4″ of rain. The peak wind registered was 37 mph, at about 6:30 yesterday. 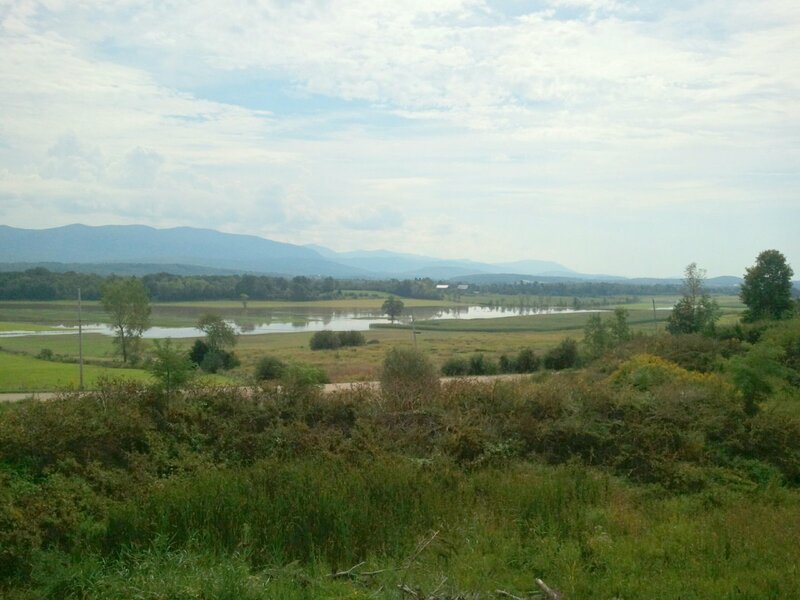 Breadloaf campus saw 5.13″ of rain, bringing their August rain to 11.27″. They saw a peak wind gust of 39 mph, later in the evening than down in the valley. 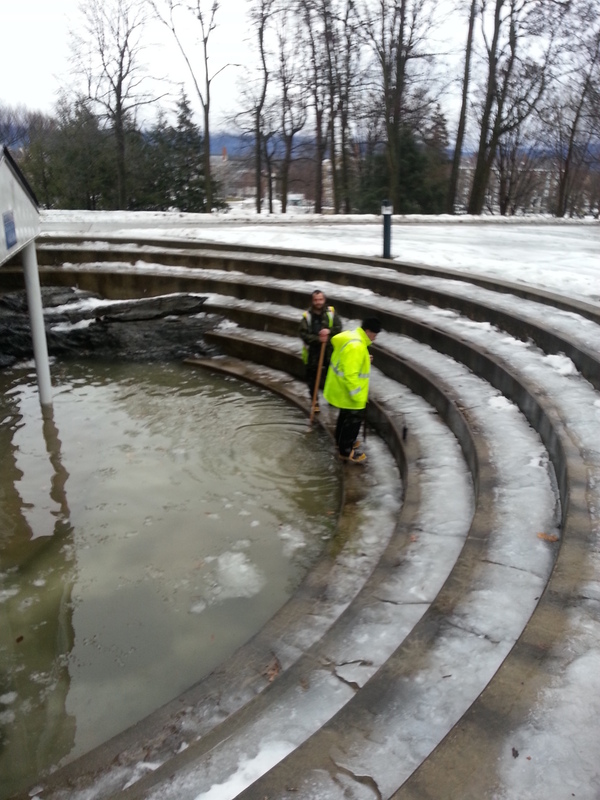 No major problems occured on campus. Facilities was busy with their usual leaks here and there, but it didn’t seem any more significant than another big rain. We’d spent a chunk of Friday mobilizing for the storm; gassing and sharpening chain saws, getting wet vacs ready, checking pumps. Monday morning dawned clear and fresh, and revealed a mid September amount of fallen leaves, along with a plethora of sticks. 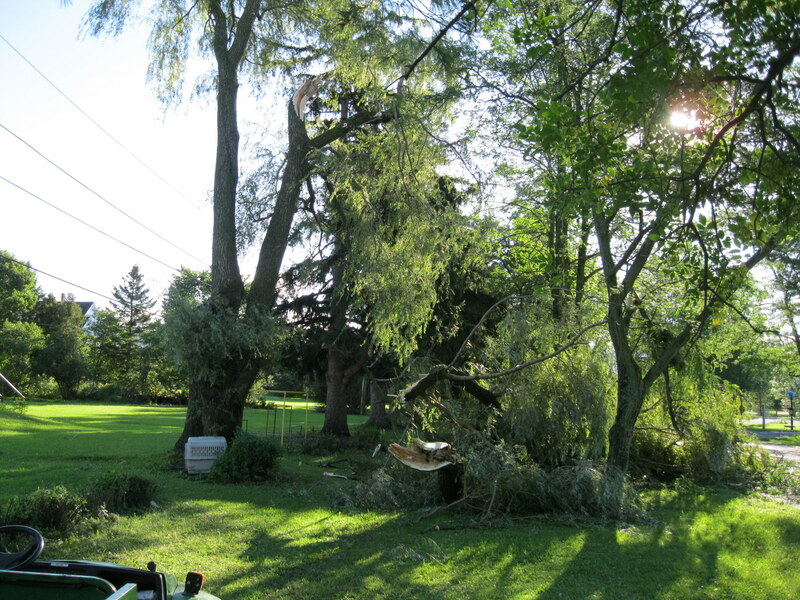 Some large branches broke in the wind, as well as having a couple of trees topple over. Overall, however, I was pleased with the relative lack of tree damage. 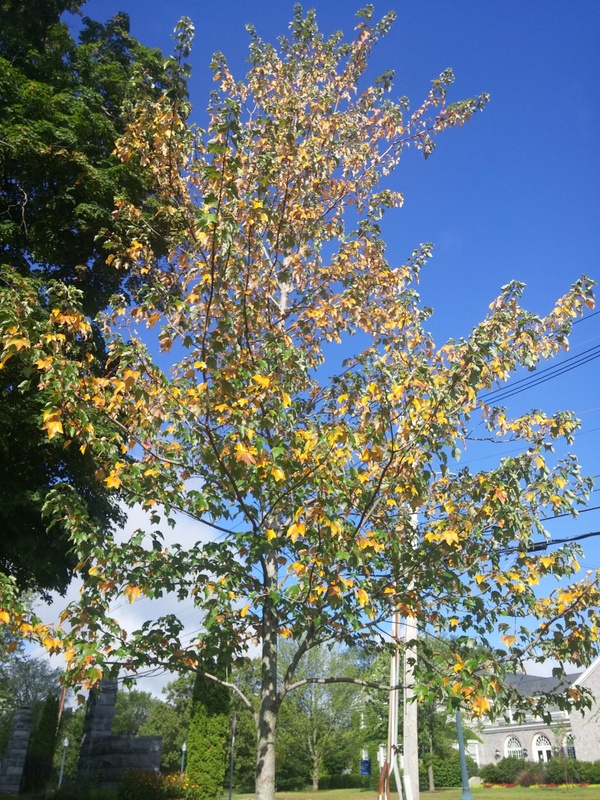 This late in the year weak trees are already shedding their leaves, or have thinner than usual crowns, so the more storm prone trees have less “sail” to catch the wind. A large limb heavy with black walnuts fell behind Turner house, but other fruit bearing trees did fine. 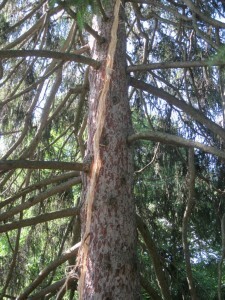 The immense rain in a short amount of time causes the most damage for trees. The soil below the tree turns to soup, roots lose their holding capability, and trees can topple in the wind. A good example is a Basswood lost right below Gifford, at the base of the ledge. All the water percolates a little ways down the soil profile, until it hits the ledge, then drains downhill right towards this tree. Combine that with the lack of roots on the ledge side of the tree, and the reason this tree fell is pretty clear. 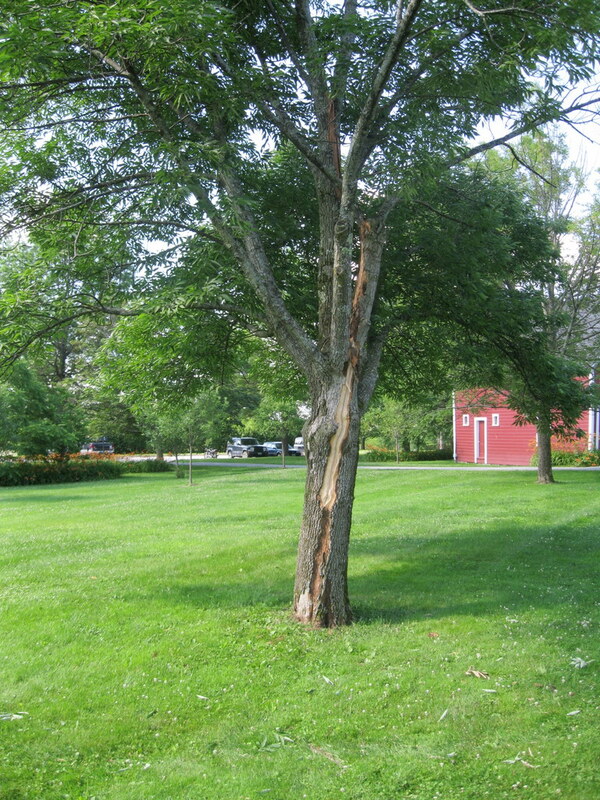 Another tree with a compromised root system was a Poplar growing out of a stone wall behind the Hadley House Barn. One of our crew members commented how the roots went right through the wall, and this was a good reason to remove sucker trees before they get too large. Overall, we did fine. Here’s another couple of pictures of some damage, we’ll have it cleaned up in another day or so. This one was tricky. 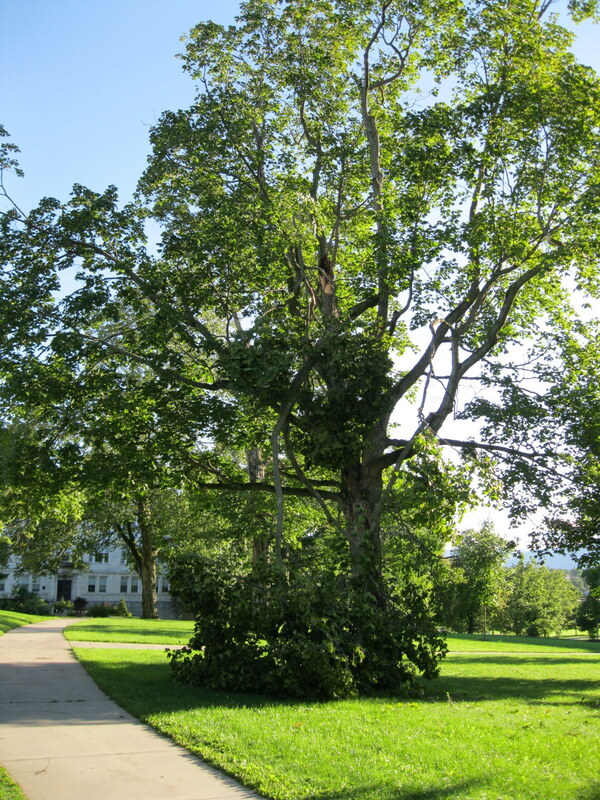 A Black Maple on the east side of Old Chapel lost a large limb, breaking another couple, but the limb was held up in the tree by an old cabling system, so extracting the limb from the tree involved some minor rigging and rope work. 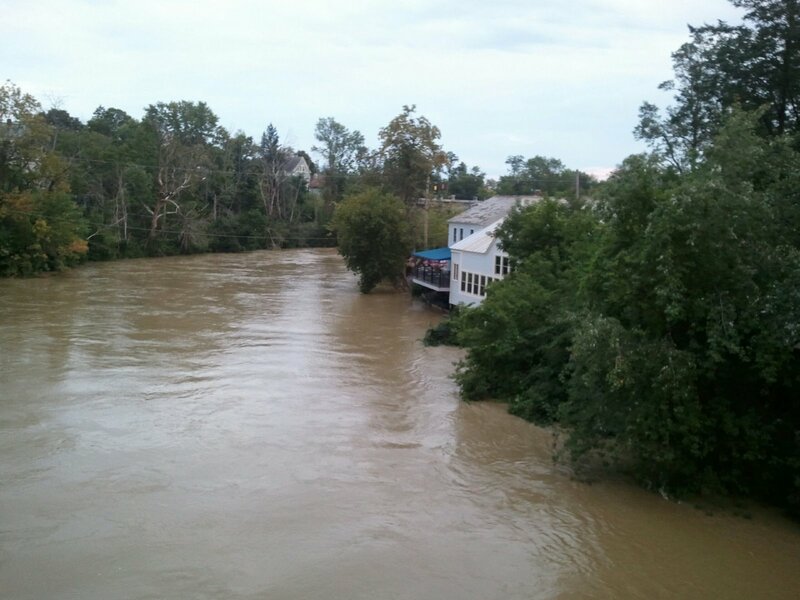 This entry was posted in Midd Blogosphere and tagged flooding, storm report, Weather, weather station on August 29, 2011 by Tim Parsons. Last wednesday we had a rip-banger. 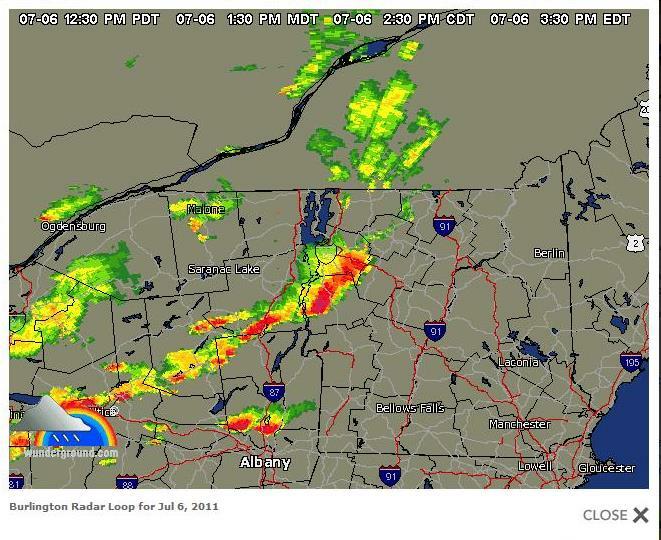 Thunderstorms developed in the hot summer air over Northern New York, and built as they tracked across the lake. 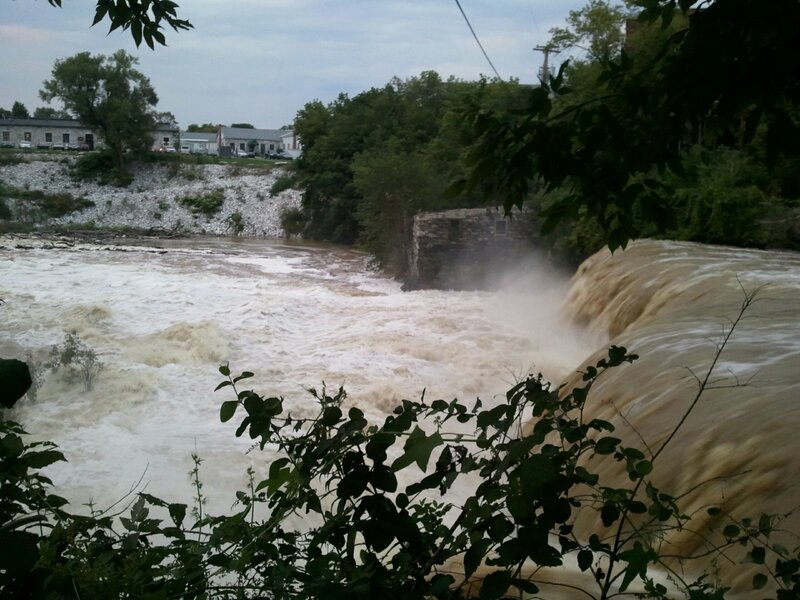 The line continued to build once across the lake, and erupted on top of Middlebury. I was sitting at home, (I was at work early), watching lightening strike all around us, many up on the ridge of Snake Mountain, some in the fields below. The wind was howling, and sheets of rain poured down. 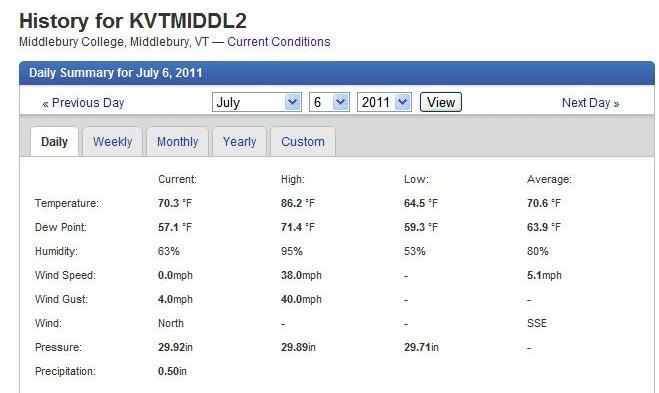 The Middlebury weather station recorded a 20 degree temperature drop in less than a half of an hour, and more than a half an inch of rain in the same amount of time. 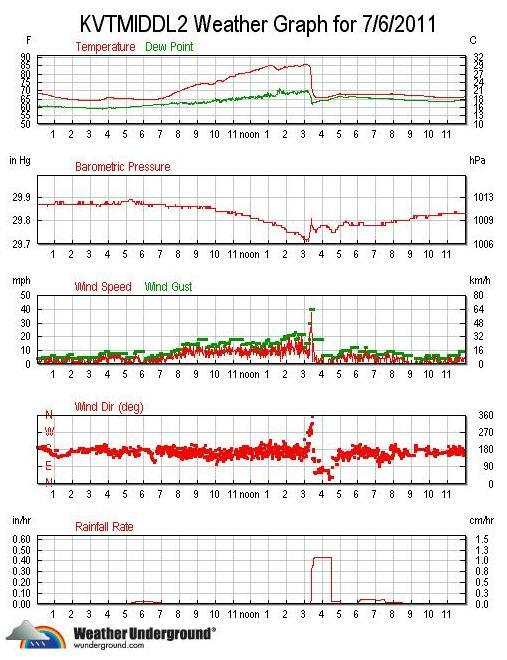 Peak wind gust came in at 40 mph. 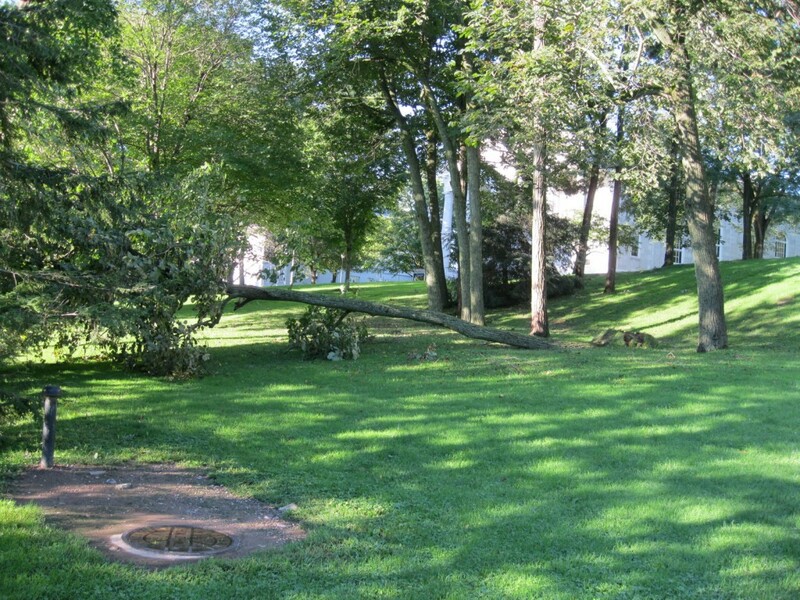 The college weathered the storm ok, but 3 trees took it quite hard. 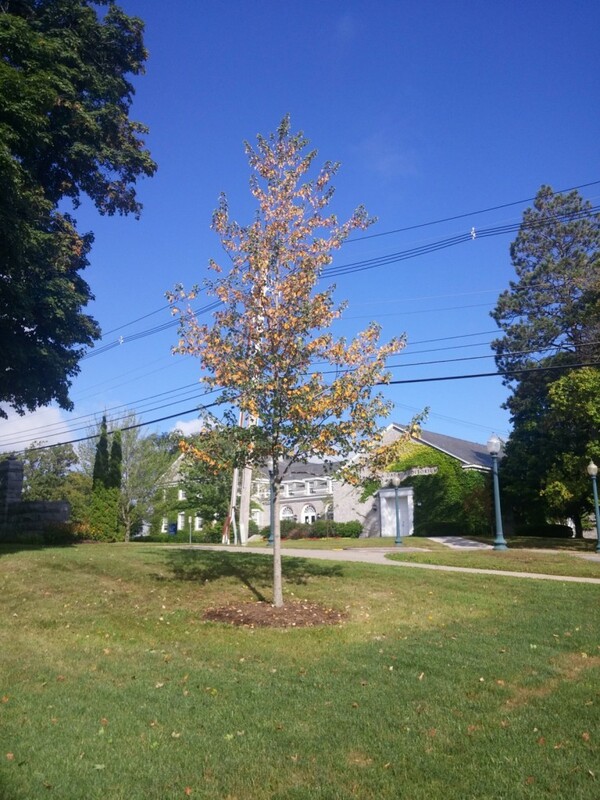 A Green Ash behind Emma Willard (Admissions) took a lightening strike-that was interesting, as it was the shortest tree around, but it was all by itself in the center of the back yard. Another tree we lost, not surprising, but still sad, was a large Weeping Willow on the northwest side of Battell Beach (the upper Quidditch Pitch). We almost always see Adirondack chairs underneath this tree. The center two stems of this tree had a fast moving fungus that caused a rot in the sapwood of the two center trunks. 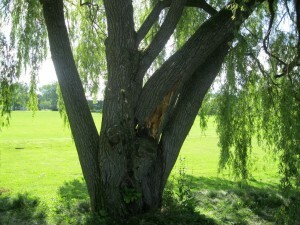 The sapwood is what carries water upwards to the branches, as well as nutrients throughout the tree, so having this vital structure rot away was a irrecoverable death in waiting. High winds torqued one of the trunks, and broke it away to lean against one of the remaining ones. We removed the tree the next day, before it broke further on someone sitting in a chair. The final tree may or may not be a casualty, time will tell. One of the large Norway spruces we left in the Main Quad Tree Removal, the most southern one, was hit by lightening. Friends at work in the service building told me it was the most impressive lightening strike they’d heard in a long time. 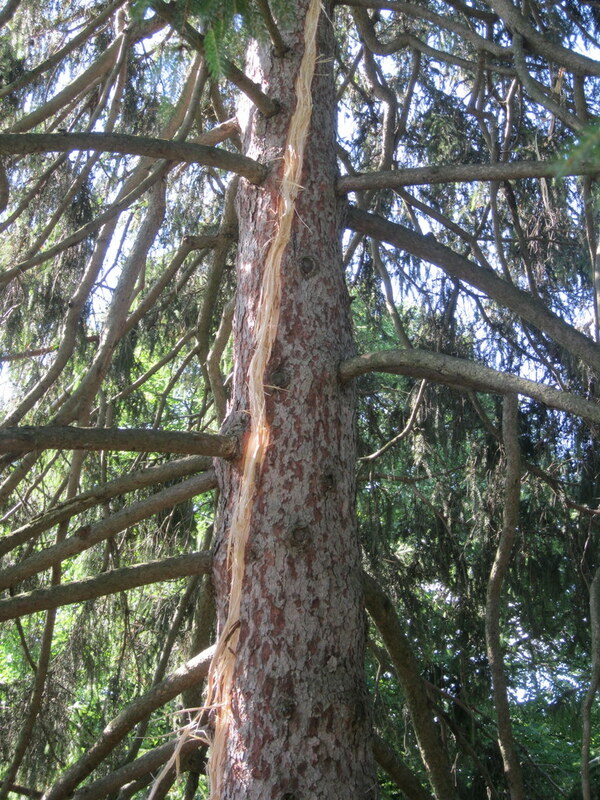 The tree shows a classic spiral scar from the top of the tree all the way down to the bottom root flare. Bark like shrapnel was scattered all over the quad in long 3′ strips, and filled the back of one of our gators. The prognosis of the tree is unknown. 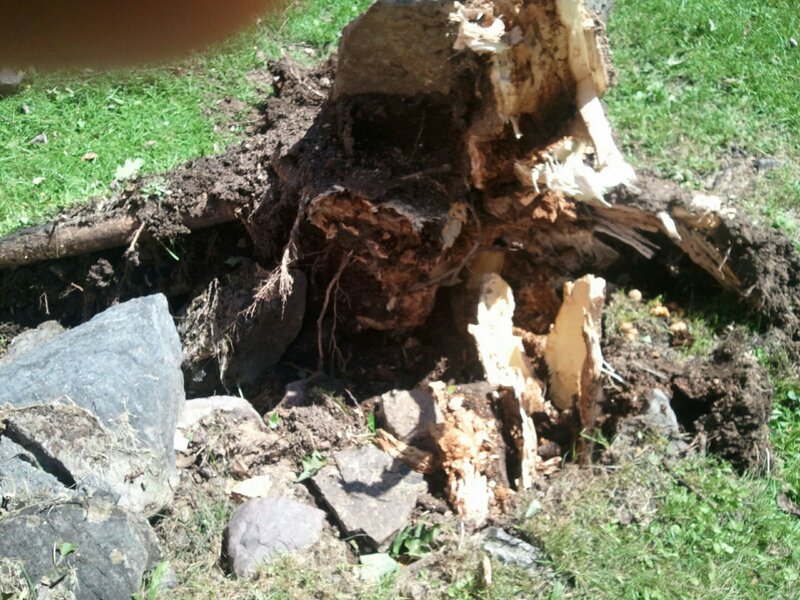 The roots seem to be intact-while there is bark peeling on the root flare, it does not seem too bad. Certainly I’ve seen trees recover from worse. We’ll know in a couple of weeks-if the tree is going to die quickly we’ll know soon. 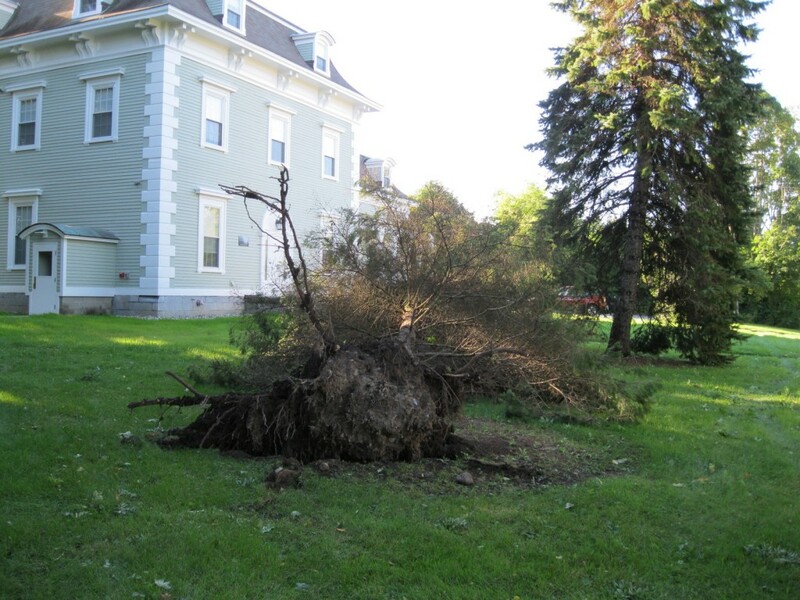 This entry was posted in Midd Blogosphere and tagged landscape, McCullough, storm report, Trees, Weather, weather station on July 10, 2011 by Tim Parsons. The most remarkable thing about this last snow storm on Monday is probably the fact I almost didn’t write about it. After this punishing winter of snow removal, yet another storm didn’t seem worthy of taking the time to whine. But, after setting some records, I thought I’d write about it, if only so students can brag to their parents. We don’t know how much snow we got here on campus, as the wind was drifting the snow so radically that some places were devoid of snow, while others were 6′ deep in drifts. 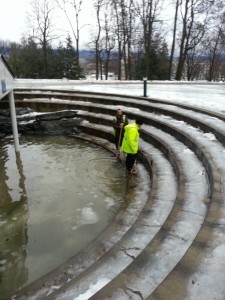 I asked the guys in the landscape department how much snow we got, and the answers are unprintable. I measured 20″ in my driveway, but that was pretty windblown too. According to the National Weather Service, Cornwall got 22″, Bridport 24″, so we’re thinking somewhere in that neighborhood sounds about right. This is one for the record books, both the storm and this winter. The Burlington Weather Service office recorded 25.8″ of snow, beating our Valentine’s Day storm of 2007 by a tenth of an inch. 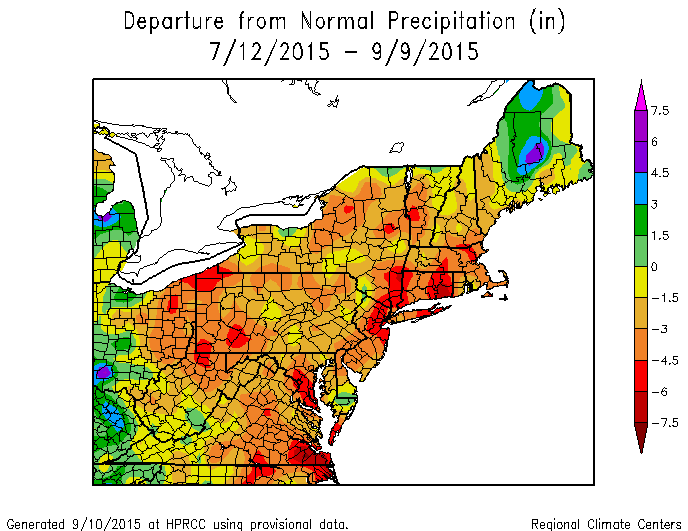 (Incidentally, the record storm was last year, January 2-3, where they got 33.1″. I’ve erased that from my memory) This is the largest March storm, however. In terms of our yearly records, we’re at 124.3″, third highest total. Number two comes in at 132″, in 1886-87, and the record holds at 145.4″, in 1970-71. 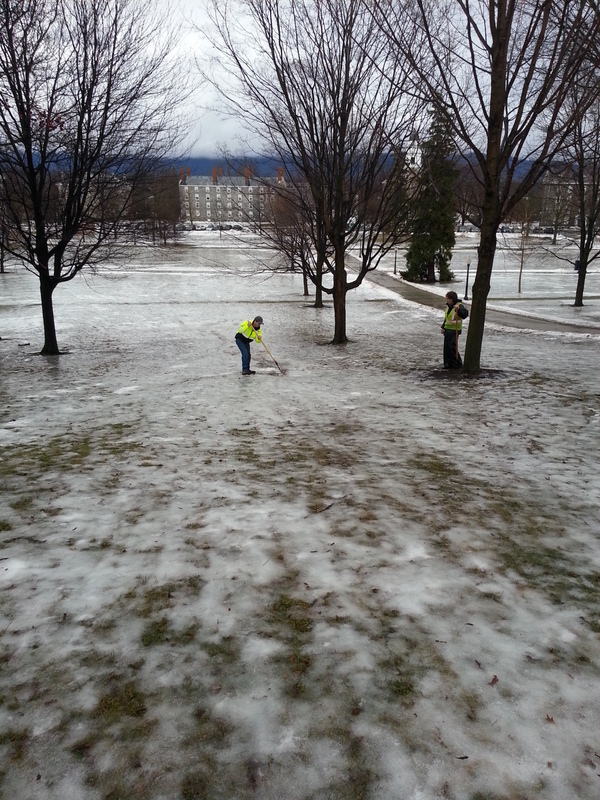 I can see us beating 1886, but if we break the ’70 record there is going to be some sore shovelers at Middlebury. Speaking of sore, yes, there are still some sidewalks not cleared yet. We’re trying! The problem with massive snows like this is that our regular plows just can’t handle it. You can only push a huge pile of snow for so long before the wheels start spinning or you have nowhere to put it. For these types of events we put large snowblowers on a couple of our tractors, but that’s slow going too. And because classes were still being held, the extra sidewalk traffic impeded progress all the more. Uncleared sidewalks means snow shovelers are walking through snow from building to building, dragging a snowblower through drifts. And on top of all of that, a lot of us couldn’t even get to work. For the most part, the only workers that made it in lived in Middlebury, except for snow miraculous sidewalk tractor operators, who I’m thinking were airlifted in. My own road was roughly plowed by a Monument Farms tractor half the size of my house-the cows have to be fed-but the town plow didn’t make it until the end of the storm Monday evening. Tired of the snow? If it makes you feel any better, the stake at the summit at the top of Mount Mansfield says they’ve got 90″. That’ll be there a while. 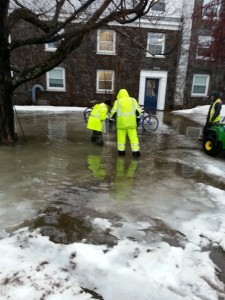 This entry was posted in Midd Blogosphere and tagged snow, storm report, Weather on March 10, 2011 by Tim Parsons.